The event started with arrival of chief guests – Dr. Om Kumar Harsh, Addl Pro-Chancellor, The Glocal University, Dr. Amjad Hussain Director Research, The Glocal University and welcome speech by Mr. Ali Khan, Student B.Pharma 4th year. The event included awareness camp in nearby village, skit and Quiz competition.Health awareness programme was conducted in nearby village by students of B.Pharmacy and D.Pharmacy, from 9:00 am – 12:00 pm on vector borne diseases. The camp was headed by Mr. Abdul Hafeez (faculty member of Pharmacy). 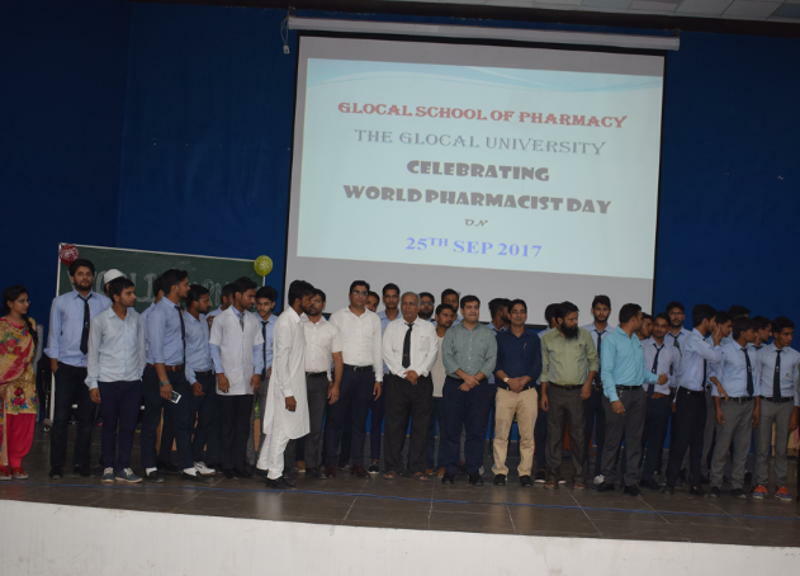 The on stage event started with an Introductory speech on Pharmacist Day by Mr. Abdul Quddus (student B.Pharma 1st Year). A skit was performed by the students of B.Pharmacy on “SAFE AND RESPONSIBLE USE OF MEDICINES” depicting the role of Pharmacists to assure the same. The next event was motivational speech by Mr. Chetan on “Career and Scope of Pharmacy”. Which was followed by a question answer round among the audience. The event was concluded by Vote of Thanks by Dr. Imran Kazmi, Dean School of Pharmacy.. The event was organized by students of B.Pharma final year under the guidance of the cultural incharge Mr. Abdul Hafeez, Ms. Chandra Kala, Mr. Mayank Yadav We are extremely grateful to our officiating Dean School of Pharmacy, Dr. Imran Kazmi and our faculty members without whose support and guidance the event could not have materialized.